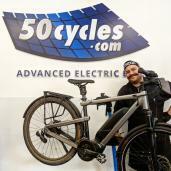 We're London's advanced electric bike specialist with 15 years in the capital. We only sell the most advanced electric bikes that give you the greatest range, comfort and enjoyment, from top brands like Riese & Müller, BeatBike, Cube, Kalkhoff, Giant and more. 50cycles has been selling electric bikes in London since 2003, originally in Belsize Park, later opening our first full showroom and test-ride centre in Richmond-upon-Thames. We opened our latest and largest showroom in Twickenham in June 2017. It's the perfect place to test ride an e-bike with a mix of riverside paths, Royal Parks and suburban roads to explore. We focus on offering the most advanced electric bikes available with powerful motors, large battery capacities and sophisticated features that make riding your bike more fun, more comfortable and more convenient. We have a wide selection of brands and models covering commuter e-bikes as well as electrically-assisted folding bikes, all-terrain bikes and cargo bikes, in different sizes and frame styles (compact, step-thru, XXL, etc). Prices range from around £1,000 to £6,000 or more for high-end models from brands like Riese & Müller, Scott, Cube, Giant, Kalkhoff and our own Beatbike brand. Interest-free finance is available on all purchase and we also accept Cyclescheme vouchers. Thousands of Londoners have enjoyed their first experience on an electric bike taking a free test ride from our showroom. We've sold and supported more electric bikes than any other business in London over the past 15 years and we employ staff who are friendly, knowledgeable and have a knack for finding the right e-bike for you, whatever your requirements, age or ability. There's no need to book, you're welcome to walk in and ride whatever is available. If the bike is on the shopfloor it's available to ride. We'll take time to demonstrate how it works and how to ride safely, recommending local test ride routes and offering a helmet and high-viz. We ask for basic ID but no deposit is necessary, nor is there any obligation to buy. But if you really enjoy your test ride you will be able to ride a bike away once we've taken your order and checked it over. We also offer free UK mainland delivery. We're offering £1,000 off the new BESV PS1 compact Carbon electric bike. It's super light but well-equipped. It has the power to give you confidence when taking on London's busy streets but small and light enough to store at home or at work. Looks cool too!